I had heard good things about To Kill a Kingdom and it didn’t disappoint. It just got a little predictable at some points, but it very much is a re-imagining of The Little Mermaid. I give To Kill a Kingdom by Alexandra Christo four out of five hearts because it was a great read, but predictable at certain points. It took me forever to get hooked enough to make me want to finish the novel. I was already 153 pages in before I picked it back up during the MagicalAllNighter of the N.E.W.T.s Read-a-thon and still finished it that same evening. I loved Lira in the beginning, she is a cruel and refreshing character, but the further the story moves along the less I cared about her. She behaves more and more like she doesn’t care about Elian and then all of a sudden falls in love with him. Elian is an interesting character, but I wish Alexandra had put more effort into explaining why he exchanged the palace for the sea at some point. The only think we know is that he prefers it over the restrictions the palace puts on him. Madrid, Kye and the other characters were great even though they weren’t as much in frame as Elian and Lira. They had so much banter, between themselves but also with Elian and Lira I was constant snickering while reading. I had a lot of fun. I did like the world, with mermaids, sirens, pirates and lots of kingdoms. Usually worlds only have one of these and so I was really happy that they were all there. And the interactions between them were very interesting to see. The world has a lot of potential for even more stories. 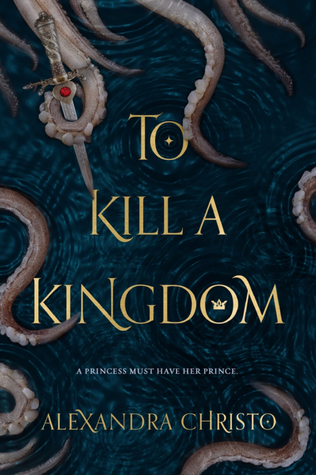 Overall I loved To Kill a Kingdom, even though it was a little bit predictable and you could point out all the points Alexandra had taken from The Little Mermaid and other stories. But still it was a great novel. I am curious what Alexandra can come up with now. This entry was posted in Book Review and tagged Adventure, Alexandra Christo, Book Review, Drama, Fairy Tales, Fantasy, Mystery, Romance. Bookmark the permalink.